Are Japan’s plutonium and reprocessing policies really restrained by the U.S.? Under the Agreement for Cooperation between the United States of America and the Japanese Government concerning Peaceful Uses of Nuclear Energy, Japan has been authorized to reprocess nuclear fuel used in nuclear power plants. As plutonium can be extracted in such process, Japan has accumulated approximately 47 tons of the material, which can produce 6,000 nuclear warheads. As the U.S.-Japan nuclear agreement is set to expire in July 2018, now is a good opportunity to review these policies Indeed, there has been formal discussions in Japan regarding the necessity of whether to renew the U.S.- Japan nuclear agreement. Based on the findings of the New Diplomacy Initiative Energy Project, this paper aims to verify the aforementioned discourse. 2. 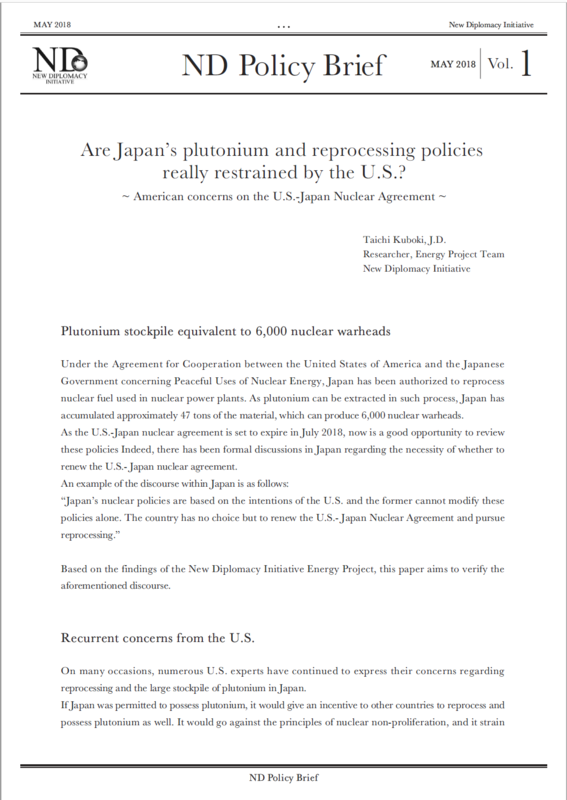 Recurrent concerns from the U.S.
On many occasions, numerous U.S. experts have continued to express their concerns regarding reprocessing and the large stockpile of plutonium in Japan. If Japan was permitted to possess plutonium, it would give an incentive to other countries to reprocess and possess plutonium as well. It would go against the principles of nuclear non-proliferation, and it strain relations between Japan and countries such as China or South Korea, which may perceive Japan’s potential nuclear deterrence as a threat. Many experts also fear for nuclear security, namely the danger of the plutonium getting in the hands of terrorists. In the U.S., nuclear power plants and reprocessing are recognized as two separate issues, and even among the proponents of nuclear power plants, half of them are against reprocessing. For example, John Holden, a former Senior Advisor to the U.S. President (in charge of Science and Technology at the time), told the newspaper Asahi Shimbun that “In Japan, enough plutonium has already been stored, and I hope this amount won’t increase anymore. Separated plutonium can be used for nuclear weapons, and our basic idea is that the smaller the number of countries that reprocess, the better.” (Asahi Shimbun, Oct. 6, 2015). Before the expiration of the agreement in July 2018, the New Diplomacy Initiative made several visits to Washington D.C. (July and September 2017, February 2018) in collaboration with the Citizen’s Nuclear Information Center (CNIC) and collated opinions from those involved in the U.S.-Japan nuclear agreement issues. The following is an extract from some of the opinions we heard from congress members and senior advisors. According to our interview results, regardless of Democratic or Republican affiliation, Japan’s plutonium stockpile is seen as a serious threat on nuclear non-proliferation. Several interviewees called for Congress to consider issues related to Japan’s reprocessing and plutonium stockpile. We can see that the consideration of Congress for these issues reached its peak during our visit to Washington D.C in September 2017. In fact, a Congressman interested in this subject even gave us the authorization to use a meeting room in the United States House Committee on Foreign Affairs as a conference room for our team visiting the U.S.
A majority of American experts share same views on these issues. However, from the Japanese perspective, in order for the country to remain an important partner to the U.S, the nuclear agreement that authorizes reprocessing is seen as a “Pandora’s box” that should not be opened. During our visit to the U.S. last September, we participated in a public symposium organized by the American think tank CSIS (Center for Strategic and International Studies). Thomas Countryman (aforementioned), the Under Secretary of State substitute under the Obama Administration, declared that the plutonium stockpile “is casting doubt on Japan’s position of being a leader in nuclear non-proliferation.” He also asked for the country’s commitment to give clear details on how excess plutonium can be reduced, and on reaching a sensible balance of its quantity given the operation of the Rokkasho Reprocessing Plant. Jon Wolfsthal, Senior Director of the National Security Council (NSC) under the Obama Administration, also asked in the same symposium, “If Japan really wanted to stop reprocessing, how can people from the U.S. Administration declare that ‘Since Japan has been doing it so far, why shouldn’t we keep going in this direction?’” His statement reveals that he tried to break a kind of “spell”, namely that Japan’s reprocessing policies are under the thumb of the U.S.
After collecting opinions from many experts, our research results revealed that there are very few American experts who support the continuation of reprocessing in Japan. As confirmed by our research results, the aforementioned discourse is merely a delusion. The U.S. does not determine Japan’s reprocessing policies, and Japan is actually the one making decisions by continuously turning a deaf ear to the voices from the U.S. Indeed, the country is wishing to change the “comprehensive and prior agreements” (note: authorized under the U.S.-Japan nuclear agreement) which have led to the accumulation of plutonium in Japan. Japan’s plutonium stockpile is casting a dark shadow on the security environment of East Asia. We need to have an open debate in Japan about our reprocessing policies from a diverse perspective, taking into account various opinions from the U.S.
Copyright© New Diplomacy Initiative. All Rights Reserved.